An acknowledged challenge for humanitarian democratic education is its perceived lack of philosophical and theoretical foundation, often resulting in peripheral academic status and reduced prestige. A rich philosophical and theoretical tradition does however exist. This book synthesises crucial concepts from Critical Realism, Critical Social Theory, Critical Discourse Studies, neuro-, psycho-, socio- and cognitive-linguistic research, to provide critical global educators with a Cultural Historical Activity Theory (CHAT) framework for self- and negotiated evaluation. Empirical research spanning six years, involving over 500 international teachers, teacher educators, NGO and DEC administrators and academics, traces the personal and professional development of the critical global educator. Analyses of surveys, focus groups and interviews reveal factors which determine development, translating personal transformative learning to professional transaction and transformational political efficacy. Eight recommendations call for urgent conceptual deconstruction, expansion and redefinition, mainstreaming Global Citizenship Education as Sustainable Development. In an increasingly heteroglossic world, this book argues for relevance, for Critical Discourse Studies, if educators mediating and modelling diverse emergent disciplines are to honestly and effectively engage a learner’s consciousness. The Critical Global Educator will appeal to researchers, academics and postgraduate students in the fields of citizenship, development, global education, sustainability, social justice, human rights and professional development. In the current political climate of conservatism – where some politicians openly advocate scrapping the UK Human Rights Act; where the national citizenship curriculum is challenged on the basis of being too global and not sufficiently focused on British citizenship; and where the cosmopolitan aspirations of the EU project are met in some quarters with calls for ‘Brexit’ – these lofty goals may seem rather distant. Yet they are admirable and vitally necessary for the promotion of a critically engaged social justice citizenry. Poetic licences (and protestations) notwithstanding, there is much to admire here; in particular the author is to be applauded for the sharp integration of the many theoretical strands and perspectives that flow in and out of the various ‘global educations’ at work in the UK over the past decade. McSharry, M (2016) 'The Critical Global Educator: Global Citizenship Education as Sustainable Development', Policy & Practice, A Development Education Review, Vol. 22, Spring, pp. 157-160. Glen Water, "The Critical Global Educator: Global Citizenship Education as Sustainable Development by Maureen Ellis," Comparative Education Review 61, no. 1 (February 2017): 220-222. 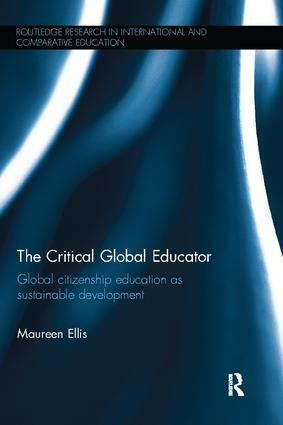 "This book represents a theoretical and empirical contribution to an understanding of global citizenship education as sustainable development and a conceptualisation of the critical global educator…Ellis’ in-depth analysis gives voice to 18 interviewees in a vivid portrayal of the critical global educator." 1. Bible to bibliography: Personal, professional and political efficacy 2. Globalisation: Sustainable global citizenship 3. Philosophy transcends mediated modes 4. Personal search, public research 5. Policy, politics, glocal integrity 6. Conviction, verification, in-forming CHAT 7. Dreams, drama, performative dharma. Maureen Ellis gained her PhD from the Institute of Education, University College London, UK. She is currently Senior Research Associate at University College London Institute of Education, Development Education Research Centre, UK, and an Associate Lecturer at the Open University, UK. Dr. Ellis has taught, trained teachers and undertaken consultancies in Europe, Africa, Asia, the Middle East and Australia for British publishers, universities and English language organisations, including the British Council. This is a series that offers a global platform to engage scholars in continuous academic debate on key challenges and the latest thinking on issues in the fast growing field of International and Comparative Education.